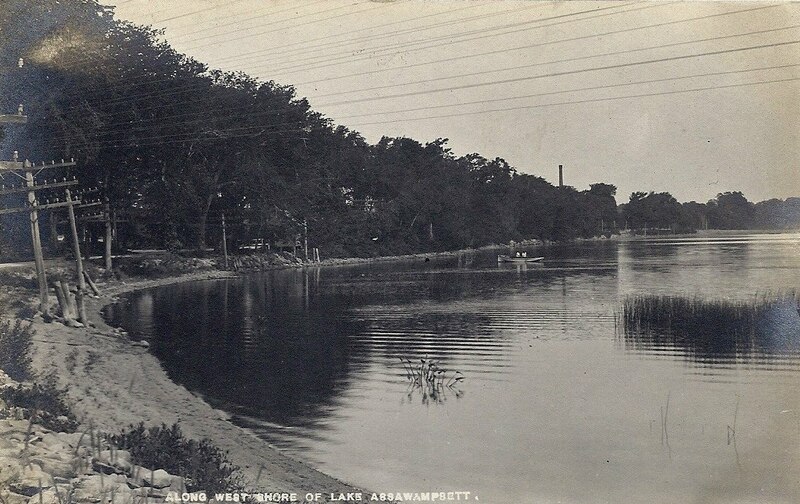 The above two views depict the southern shore of Lake Assawompsett in Lakeville from nearly the identical spot about a quarter century apart. The top view was photographed as part of a series of staged scenes which were published as stereoscopic cards in the last quarter of the 19th century under the title "Lakeville Views" by druggists Shaw & Childs of Middleborough. 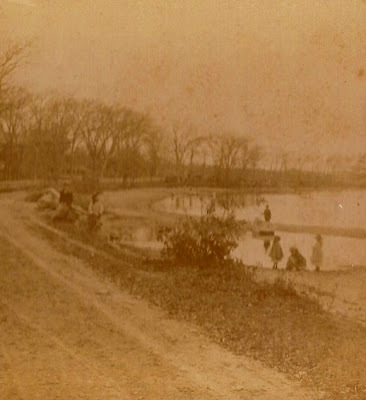 The same subjects appear in a similar view taken in the same vicinity and published as a part of the series. The view appears to have been taken during a particularly dry year as a considerable expanse of shoreline is exposed. By the time the second view was taken in the early 1900s, the City of Taunton had erected its pumping station (the smokestack of which can be seen at right center above the treeline) on the shore of the lake. Technology had also arrived with the construction of the trolley line along Bedford Street linking Middleborough with New Bedford, and the telephone with its ubiquitous poles, an intrusive addition to the scenery. In both scenes, however, boaters enjoy the waters of the lake.